I’m not the one to fall for cutesy packaging, because I went through the ‘princess phase’ a long time ago. Yes, the Dear My Enamel Lips-Talk may look excessively cute, but don’t let its exterior fool you. These lipsticks pack a serious punch of colour and are oh-so comfortable to wear. The Dear My Enamel range was actually created to celebrate Etude’s 10th anniversary and is a hybrid between a lipstick and lipgloss, making it glide on smoothly. There are 10 different shades ranging from pinks to reds and it contains Plum, Apricot and Peach Oils, Royal Jelly and Sunflower Seed Oil. That’s probably why it’s very nourishing, doesn’t bleed, nor does it emphasise fine lines/creases in your lips. You can dot them on to get that Korean Hallyu star ‘lip ombre’ look. And if you’re after a bit more of a punch, one swipe will do the job. I did a first impression and a few swatches on my Snapchat when I first got these and I love them. 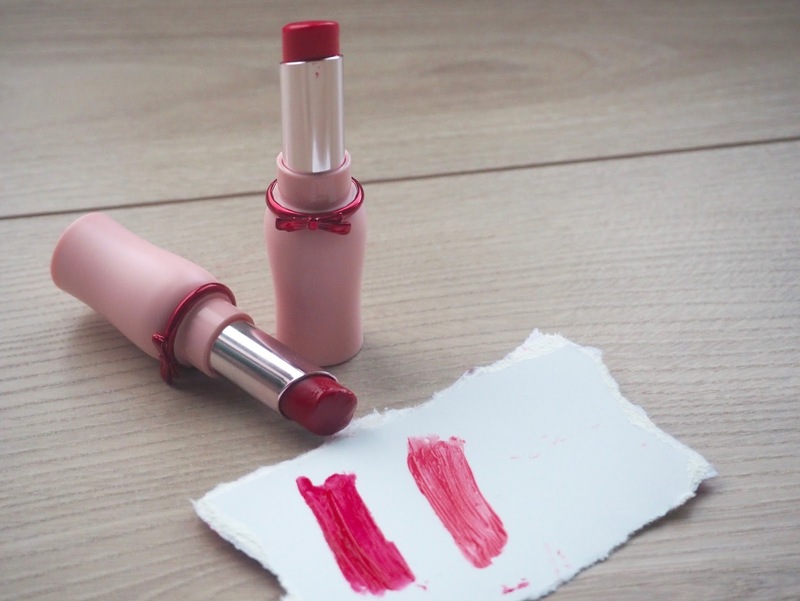 My friends know that I’m a sucker for red lipsticks —I’ve got far too many and they’d probably last me a lifetime, yet I keep buying more. RD303 is a gorgeous opaque, vibrant strawberry red that would look great on all skin tones. Its got a blue-undertone so it doesn’t make your teeth look yellow. Surprisingly, my favourite out of the two has got to be PK004, a cool-toned pink. I’m usually not a pink lipstick fan, as I find it doesn’t suit my skin tone very well, so you can see why I’m surprised. It’s a very flattering pink that isn’t too opaque and pasty and it can be easily layered for more intensity. As they’re quite nourishing, sadly they don’t last all day without touching up, which I personally don’t mind. I’ve been wearing PK004 quite often since I got it and I’m not sure what’s up with the colour, but it just makes me look so much more awake, makes my skin look brighter and I just feel amazing. They last about 4-6 hours on me and fade away gradually by leaving a subtle stain. Despite not being a massive fan of the packaging – I prefer more classic/minimalistic styles – I’ve put RD304 (a vampy wine-red) and PK001 (a punchy-fushia) on my wish list already. I guess I should change my life’s motto to: “One can never have too many lipsticks”. PS. If you’re based in the States, you can directly order from their e-shop and known retailers. If you’re based in the UK and rest of Europe, eBay or W2Beauty would be your best shot —iamlove-shop is my preferred eBay seller. Next Post The Black Friday Deals You Can’t Miss!